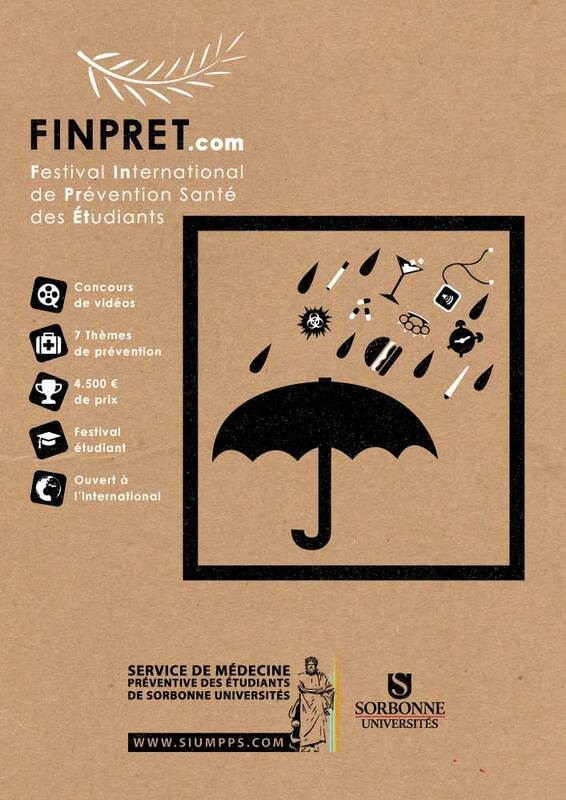 FINPRET is a French short-film festival promoting preventative healthcare for students. It is produced by the health services of Paris Sorbonne. You must be a student to participate: you must include a student ID and proof of registration to your submission materials. Your film should be no longer than 3 minutes and no shorter than 20 seconds. You may submit as many films as you would like! Videos are accepted in French, sub-titled in French, or silent. Please read competition regulations ! The Service InterUniversitaire de Médecine Préventive et de Promotion de la Santé (SIUMPPS) [Trans: Interuniversity Service for Preventative Medicine and Promotion of Health] of the Sorbonne Universities (SU) is organizing a free competition open to students, titled: Festival International de Prévention Santé des Étudiants (FINPRET) [Trans: International Festival for the Preventative Healthcare of Students]. To lead students toward a reflection on the theme of public health in the university by inviting them to produce an audio-visual project. To raise student awareness on the theme of preventative healthcare within the university context by showing selected and award-winning short films. The competition is open to students registered at a university or an institution of higher education during the 2014-2015 and 2015-2016 academic years, in France or abroad. The “SIUMPPS Sorbonne Universities Prize” is reserved exclusively for students within the community of universities and institutions of the Sorbonne Universities. That all credentials mentioned within the entry materials be published online: a student ID or proof of current registration at an institution of higher education will be required pour all entries, as well as a valid state-issued ID. That anyone who is considered a minor in their country of residence is required to include a scanned letter of parental authorization for participation in the FINPRET festival within their submission materials. That the participant accepts that the festival will upload their video to the FilmFreeway platform. Addictions: alcohol, tobacco, drugs, gambling, social networks. The decisions by FINPRET festival jury for the International Jury Prize and the Sorbonne Universities Prize will be determined by the video’s pertinence to the theme of the competition, as well as originality and the artistic and technical quality of the project. The jury’s decisions are final. They do not require justification and cannot be appealed. The BUZZ prize will be awarded to the finalist whose video has received the greatest number of views during the given period of public viewing on the site https://finpret.com. The competition’s jury brought in to select the finalists for the International FINPRET Jury Prize and the Sorbonne Universities Prize, will be composed of at least five people designated by the competition’s Organizing Committee. The candidate accords to SIUMPPS and to the member-institutions of the Sorbonne Universities the right to freely use and to broadcast their video in a non-commercial manner, whatever that may be, and in whatever form and process that may be, during the duration of no more than two years from the date of their entry to the present competition. To use the videos, they will be added to the Vimeo platform by the festival. In all media publications within the context of publicizing and promoting the results of the festival. In the application of their moral right, the candidate may demand at any moment the cessation of use of their work. Be aware of, and accept, without reserve, the present principles and regulations of the competition. All fraud or attempted fraud in the present competition will result in disqualification of the person or team to which they belong. Respect the general terms and conditions of the platforms FilmFreeway (https://filmfreeway.com/page/terms-of-service) and Vimeo (https://vimeo.com/terms). If possible, participate in the awards ceremony that will take place in Paris.